Shores offers a choice of two brand new, modern and beautifully presented, self-catering apartments purposefully built for quiet, comfort and relaxation. Enjoy amazing views of iconic Mount Manaia and gentle Taurikura Bay. Air conditioners and laundry facilities ensure comfort and convenience. Wireless broadband internet, Freeview TV, a wide DVD selection and top NZ magazines allow you to completely relax. 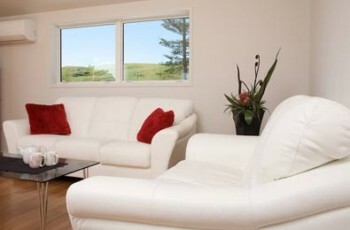 The Manaia Apartment is a contemporary, top quality two double bedroom, fully self-contained apartment. It has a spacious living area, deck with outdoor furniture, fully equipped kitchen with dishwasher and full sized fridge. The Koru Studio apartment is affordable comfortable accommodation suitable for a family or couple with a double bedroom and separate bunk alcove. It has a sheltered patio with outdoor furniture. Immerse yourself in Northland’s natural beauty away from the tourist crowds. The beach is just across the road. Kayaks, tennis rackets, dinghy and boogie boards are available.